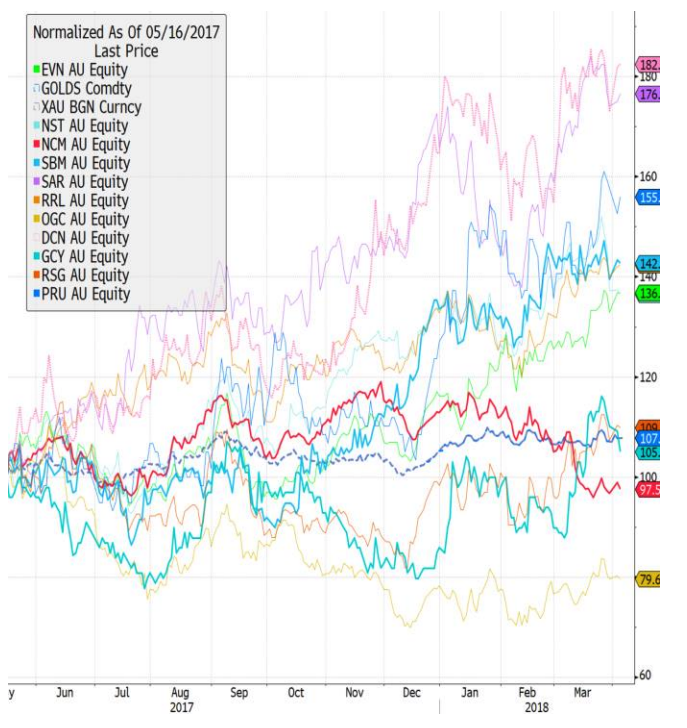 We have previously discussed A$ gold as a hedge to global market volatility, and highlighted our particular interest in Australian gold producers that boast high-margin, low capital-intensity assets with solid mine life and/or exploration upside. Dacian Gold, discussed below, was acquired in a period of volatility, providing an attractive price entry point, and has since proven to be a solid performer. Dacian’s cornerstone asset is the 100% owned Mt Morgan high-margin gold project in the Laverton goldfield in WA. Gold resources delineated to date has been excellent. First gold pour was achieved at the end of March 2018, with commissioning and production ramp up now underway. Dacian is well placed to produce 200koz+ p.a. of gold from FY19F at all-in costs of ~$1000/oz. The company continues to offer excellent exploration upside with a high likelihood of increasing its already impressive 10yr+ mine life. With A$ gold prices >A$1700/oz, the company is set to generate strong free cashflows. Rohan Williams, Executive Chairman and CEO, is one of the best in the business. Having done this successfully before with Avoca (micro-cap gold exploration IPO, de-risked through financing, development to production, before a takeover for ~$1b by Anatolia Minerals), Rohan is doing it all over again with Dacian and is well-aligned with strong equity ownership. Dacian’s share price has exhibited a typical resource ‘S-curve’, where the stock initially re-rated through its exploration, resource delineation and feasibility phases, then correcting through its funding and construction phases. 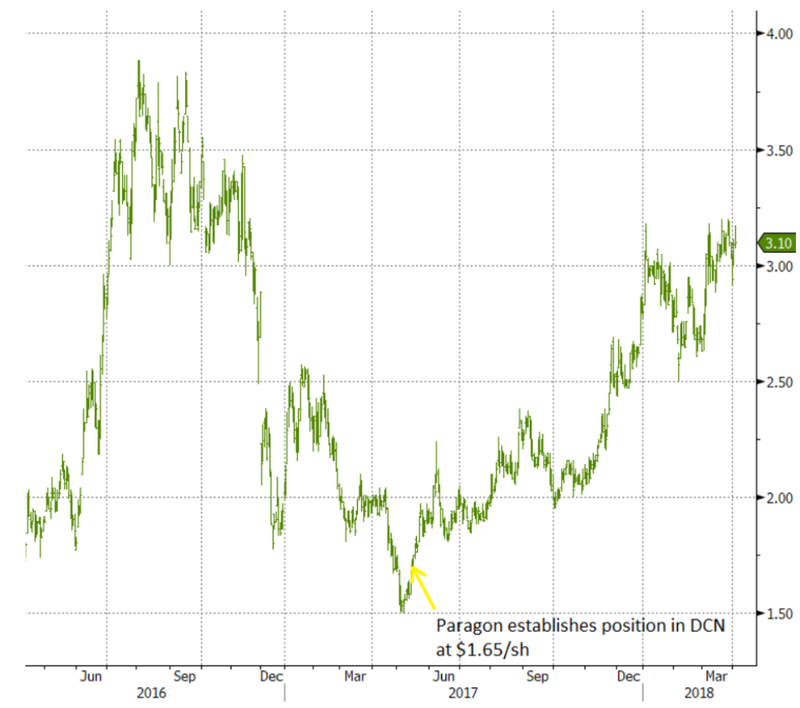 We patiently waited for Dacian to de-risk its funding phase, and then established our position in mid-May 2017 at $1.65/sh at an EV/FY19F CF multiple of ~2.5x. This compares with producing peers with similar attributes that trade at ~8x. We were confident Dacian’s ‘plain-vanilla’ 2.5mtpa plant construction being done by GR Engineering (a firm who has a great track record of execution and in our opinion, is one of the best in Australia) would be completed on time and budget, as has been the case. Pleasingly Dacian’s share price has almost doubled since our entry point and still offers value at a modest ~5x FY19F CF. Since our entry point, Dacian (DCN; shown in dotted pink above) has been the best performing gold stock on the ASX. We have been able to partially hedge its gold price risk by shorting Newcrest (NCM, shown in yellow above) which is expensive in both absolute and relative terms, and has complex assets with gold production risks to the downside. Finally, we also expect M&A in the Australian gold sector to return due to larger peers pursuing growth opportunities. In our view, Dacian’s Mt Morgan is the most attractive mid-scale (200koz p.a.) production asset on the ASX making it a highly desirable asset. Its next material resource discovery will likely prove to be the catalyst for such acquisition activity. Great analysis, I've been a huge fan of DCN since mid last year. Great management and great dirt. Brilliant Maths John. Great Analysis. one small get away is probably a bit of hedge. could it have been better to hedge Dacian position by shorting a small cap ? NCM has a cash chest of half a billion and around 1.5 billion in net cash cash flows annually. if M & A activity picks up , it could be one of the potentials looking for expansion which would nullify the hedge.However, Great Position. keep up the good work.